THE STRAWBERRY MALLARD: Foreman Angus Reporting For Duty! Mr. Gussy, you are doing a fine job!!! Outstanding! Looking mighty handsome, says Miss Fee!! Kisses through the computer screen! 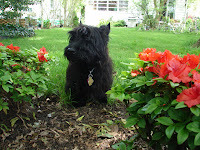 Aw Angus is so cute. I hear he has a thing for Miss Fiona!! They would make quite a handsome couple!! 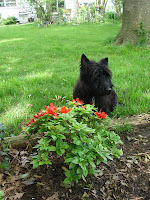 A Scottie certainly makes a perfect garden companion. He is a handsome boy.